Courtesy of WOWSA, Bowen Island, Canada. 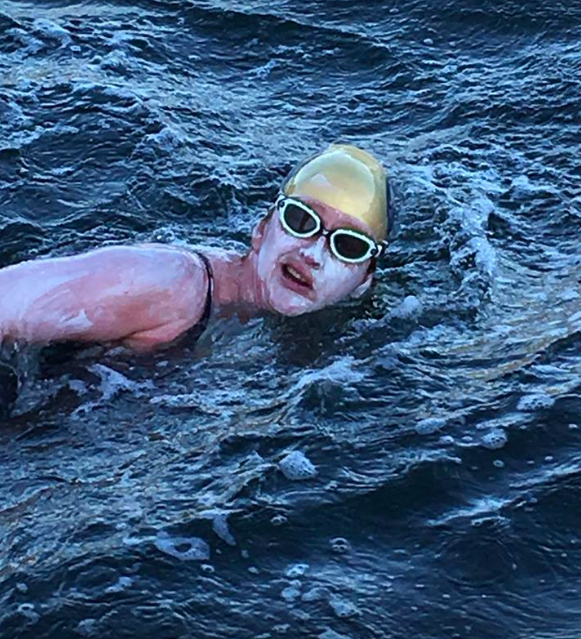 "Spots of warm water saved me," recalled Jessi Harewicz who recently completed a solo 33 km circumnavigation swim around Bowen Island in Howe Sound near Vancouver in British Columbia, Canada. The 34-year-old Canadian's ultimate tally: 21 hours 0 minutes 25 seconds swimming in 13-16°C water including the times that she had to keep swimming against the currents and swam in place at several times. Her excitement in the sport comes from both her experiences in and out of the water. "I’ve met so many amazing people in the open water swimming community in Europe and the US and Canada including Marilyn Bell." In addition to her 28.6 km crossing of the Georgia Strait from Sechelt to Nanaimo in Canada's British Columbia in 11 hours 20 minutes and a 17 hour 34 minute crossing of the English Channel and a 15 hour 30 minute crossing of the Catalina Channel, she also completed the 20 km Mercer Island Marathon Swim in 8 hours 21 minutes earlier this year. "3 in a year including two swim over 30 km...finally I can recover and do it all over again. Every time I enter the ocean, the swim is different. The marks on land may be the same. But everything else is constantly changing."